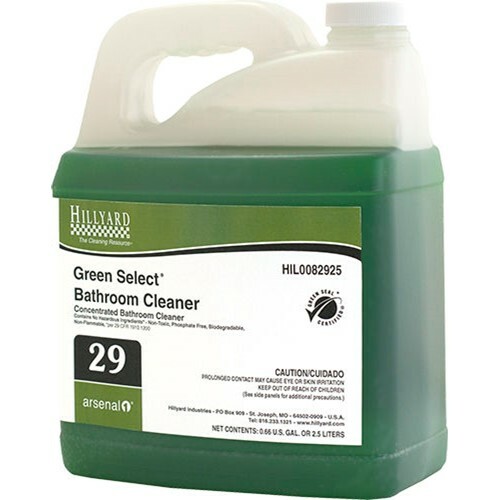 Home → Chemicals → Hillyard, Arsenal One, Green Select Bathroom Cleaner #29, Dilution Control, HIL0082925, Four 2.5 liter bottles per case, sold as One 2.5 liter bottle. Green Select Bathroom Cleaner is formulated to be non-toxic, phosphate free, biodegradable, and non-flammable. Contains no hazardous ingredients and is formulated with glycolic acid, the same organic acid found in sugar cane, beets and fruits. Effective cleaning removes soap film and hard water deposits. Good for cleaning ceramic tile, porcelain, sinks, toilet bowls, fiberglass, plastic, chrome, showers, and bathroom surfaces. Dilution rate 6 oz per gallon.